Many of my patients have no interest in going online, because they can’t trust the cancer information they find through Google, or learn where to find it. What if a structured system of hashtags helped make it easier? Tagging has been around a long time as a method of organizing content. Twitter had given it more immediacy for real-time events – whether it’s a tweet chat, a natural disaster or a sports event. Now many emerge spontaneously, and in a recent survey more than half use hashtags regularly, with a third using them to conduct searches online. When these tags emerge spontaneously, they are part of a folksonomy – user-generated organization. Spontaneous hashtags are fine to highlight a meeting, but when discussing a specific disease I believe there is value in an organized system for reliability and consistency. 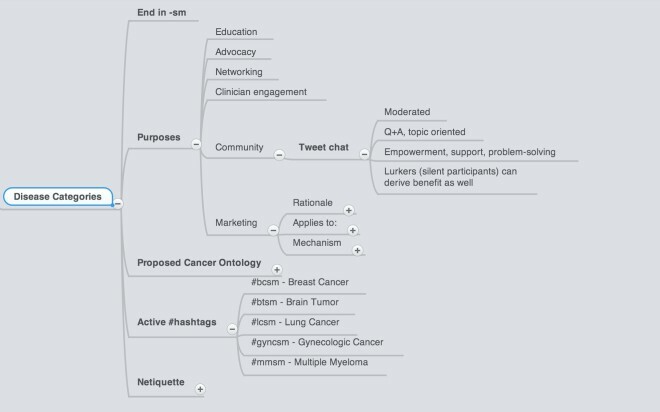 So I proposed a cancer tag ontology, a top-down system which I have shared on Twitter based originally up #bcsm, a robust breast cancer community. With the help of Patricia Anderson (@pfanderson) and others, it’s been improved to make it more practical. Symplur has now made the cancer ontology available to you. And my patients. And caregivers. And clinicians. Researchers. Marketers. Software developers. Journalists. Everyone. Top-down approaches aren’t supposed to work. But the response has been remarkable. Both MD Anderson Cancer Center and the American Society of Clinical Oncology have started using it. New groups are starting to use the other tags for new tweet chats around lung cancer, gynecologic cancer, and multiple myeloma. Part of the reason it may be working: people want to find reliable information – Google can’t provide it. But a structured hashtag system with user-based contributions, give each tag meaning. With increased use, it develops authenticity and value as a reliable resource. Organizing oncology on Twitter with hashtags does have challenges. But if we can develop a system works for cancer, I have a proposal for cardiovascular disease next. I think it may permit more of my patients and colleagues to find reliable information online. What do you think? Where does this approach succeed or fail? Matthew S. Katz, MD, is the Medical Director of Radiation Oncology at Lowell General Hospital and a partner in Radiation Oncology Associates, PA. He is former Chair of Communications Committee for the American Society for Radiation Oncology (ASTRO) and external advisor for Mayo Clinic’s Center for Social Media. He is co-moderator of the #radonc journal club and serves on committees for the American Society of Clinical Oncology and Massachusetts Medical Society. His main areas of interest are cancer care, patient education and health empowerment.